I was raised in a very music-loving family. My father always listened to 80's rock hits (that's why I love 80's music) and many other genres also. The need to be creative came at a very young age when I always wanted to learn to play the piano and guitar. After I started listening to Metallica, I realised that I wanted to learn how to play (surprise surprise biggrin.gif ) a guitar. My parents bought me a cheap Behringer starter-kit and the rest is history. Metallica was my first influence when it came to playing the guitar, so I naturally wanted to play like Kirk and James. I was always drawn more to the the rhythm-type of guitar players like Hetfield, and so I've always concentrated more on my rhythm playing and creating riffs. But I also believe that you shouldn't focus on just a few areas of guitar-playing. Every style of playing can help you become a better player. For example, metal-players can learn a lot from Jazz, Blues etc. and I love to play those genres myself. 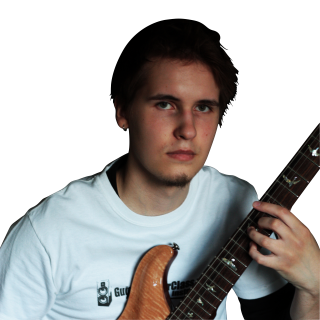 My other major influences include Mikael Akerfeldt (Opeth is one of my favourite bands), Guthrie Govan, John Petrucci and Devin Townsend just to name a few. I've learnt a lot myself from the other instructors (and students) and also just by making these lessons and trying to help other players. I usually concentrate more on the rhythm/songwriting-aspects of guitar-playing, and want to encourage other players to become more creative. I see the guitar as a tool for self-expression and want to show other players to see the many possibilities that a guitar has to offer.